It is a requirement of your Agreement, that the goods are protected against Theft and Accidental Damage. We can arrange Theft & Accidental Damage Cover for £1.64 per week. It is a requirement that products purchased on a credit agreement are insured. We can offer Theft and Accidental Damage Cover for £1.64 per week. Be greater and explore a new chapter in Marvel’s Spider-Man universe in HDR quality graphics* with the Limited Edition Marvel’s Spider-Man bundle on PlayStation®4. 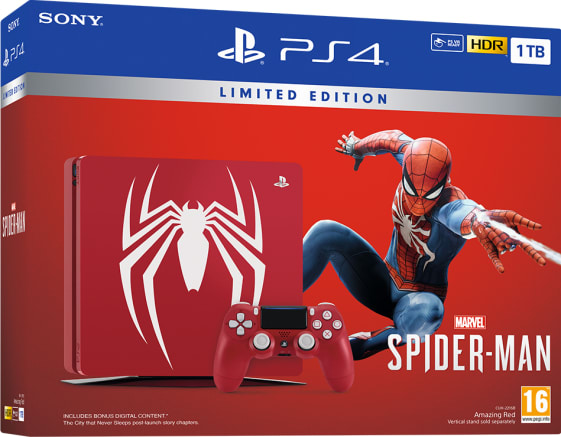 Feel the power of Spider-Man’s improvisational combat, fluid urban traversal, dynamic acrobatics and environmental interactions with the Limited Edition console.